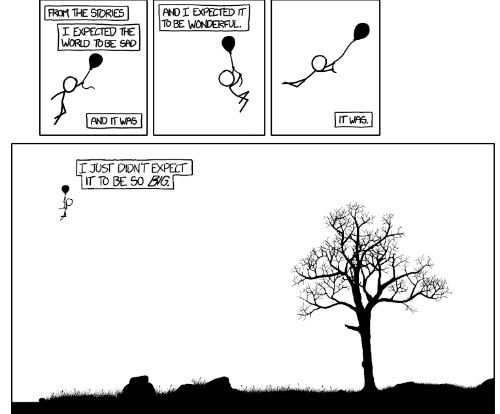 Did you happen to catch yesterday's XKCD cartoon? It was EPIC in proportions. But you wouldn't know it at first glance. At 165888 x 79872 pixels, or 1.3 terapixels, the image would fill the screens of 4212 iPads with retina displays in an 81 x 52 grid. If it was printed at a size big enough that you could see the people, it would cover a football end zone. And as you might expect in a Randall Munroe comic, there are little treasures to be discovered all over the place. I don’t want to spoil the fun, but yes, Waldo’s in there too. The scrolling is exhausting. And I am lazy. So if you're like me, you'll be interested in taking a look at the entire image, kindly hosted by Leaflet. 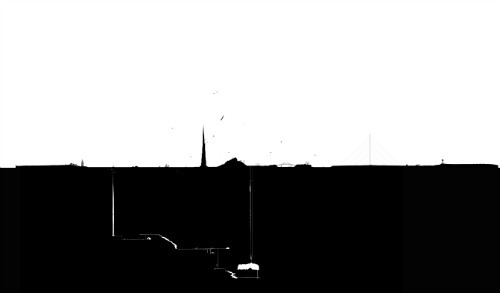 If you're curious about what's in there, here's a (very) zoomed out version of the image. It's full of surprises (notice the bunkers and spire which are absolutely huge when zoomed in) and nuggets of comedy (dozens of small scenes integrated throughout). Enjoy!